Combine first 3 ingredients in a small bowl. 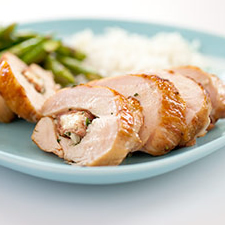 Cut a horizontal slit through thickest portion of each chicken breast half to form a pocket. Stuff about 3 tablespoons cheese mixture into each pocket; close opening with a wooden pick. Sprinkle chicken evenly with salt and pepper. Heat a large cast-iron skillet over medium-high heat. Coat pan with cooking spray. Add chicken to pan; cook 4 minutes. Turn chicken over; place pan in oven. Bake at 400° for 25 minutes or until chicken is done. Let stand 5 minutes. Discard wooden picks. Cut chicken diagonally into 1/2-inch-thick slices. Serve with pan juices. Per Serving: 252 Calories; 7g Fat (26.8% calories from fat); 4g Saturated Fat; 44g Protein; trace Carbohydrate; trace Dietary Fiber; 114mg Cholesterol; 293mg Sodium. Exchanges: 0 Grain(Starch); 6 Lean Meat; 1/2 Fat.